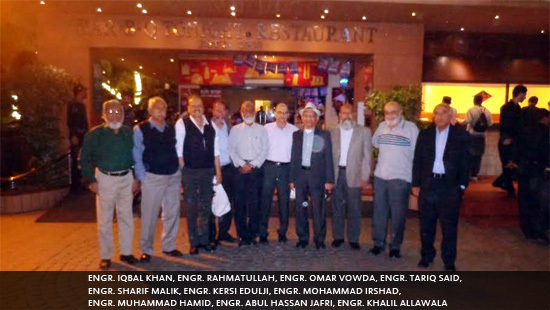 A dinner party was arranged to greet Engr. Mohammad Irshad-NED69ers-Mechanical who came to Karachi from Jubail Saudi Arabia after getting retirement from Bechtel Saudi Arabia. Irshad is settled in California, USA and while going back he dropped in Karachi for a week to visit his relatives. 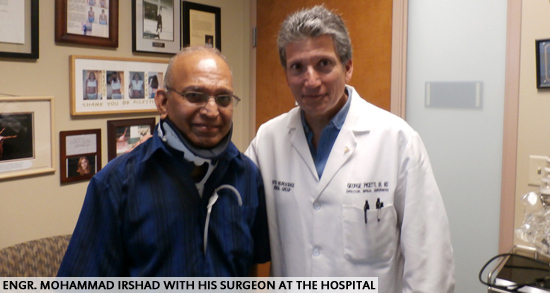 Irshad went through surgery before his retirement from Bechtel. His spinal cord functions were getting compromised due to number of defects in vertebras and there was obvious danger of paralysis neck under. This problem was first identified in Saudi Arabia in January 2015 and later confirmed b number of neurologists. Surgery performed by head of neuroscience Institute of Sutter Medical Dr. Picetti who is internationally known for his expertise in spine surgery on September 16, 2015 and was successful. Area was C2 to C7 of cervical spine. He went through rehabilitation for three months after one week of hospital stay. He was put on tube feeding due to food and liquid going into lungs. Irshad returned to Saudi Arabia on January 3, 2016 to sign off the contract. Left Saudi Arabia for good on February 3, 2016 and came to Karachi to meet friends and relatives. All the guests were there except Engr. Cdre® Najmul Hasnain-Mechanical, Engr. Abdul Rahim-Mechanical, Engr. Mohammad Akber Ismail-Civil, Engr. Mohammad Anwer-Mechanical and Engr. Iqbal Hameed-Mechanical. These friends could not come due to some urgent family commitments. Engr. 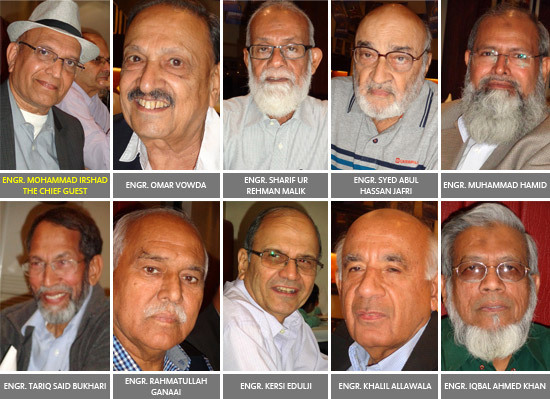 Kersi Edulji did leave one of his family get together just to meet Irshad as he never got a chance to meet him after leaving the college in 1969. It was a great gathering and meeting friends on a short dinner party was highly appreciated by all. Initially we decided to meet at Burns Road famous Food Restaurant it would have been real fun as we all spend some very precious years of our life in that area. Our chief guest and few other members were of the opinion that it will be a problem of car parking as during night the area is heavily crowded. Engr. Omar Vowda and Engr. Sharif Malik selected the menu and all enjoyed the delicious food. While we all were chatting and reviving the golden old days of NED Government Engineering College, Sevakunj, Jinnah Courts and Metharam Hostels and all the food streets of Burns Road. We very well remember the time of admission to NED College when the 1965 War between India and Pakistan was going on and we all were in the lines and we have to go into the trenches as soon as we listen the siren. There is no end to the discussion of our stay in NED College. Last but not the least we all prayed for the Maghfirah of our friend Engr. Syed Moin Raza who died in California on Friday February 05, 2016. Click the button below to view the details about him. Finally the meeting was concluded with a remark and best wished for Engr. Mohammad Irshad to have a good retired life back in USA. As all the friend request to have such gathering every month which keeps all of us young. We all left to meet soon again.